November reminds us to reflect, connect, and give thanks. Perhaps the crisp weather, the cozy scarves, and the warm-your-heart and soothe-your-soul food of the season inspire this personal change of pace. As you slow down this month, take the opportunity to gather your family and create a gratitude jar. While a basic arts & crafts project, it’s the simplicity of this DIY that makes it beautiful. Each person writes down what they are grateful for in their everyday lives on a slip of paper (it can even be a repurposed scrap!) and drops it into a jar. If you’re inspired to doodle or your tot can’t yet read/write, then you can draw pictures instead. And, of course, there is no limit to how many slips everyone can share because there is much to be thankful for no matter how big or small—parents, spouses, siblings, friends, children, chocolate, jobs, health, happiness, hobbies, toy cars, movies, pets, pie, sports, sunshine…. 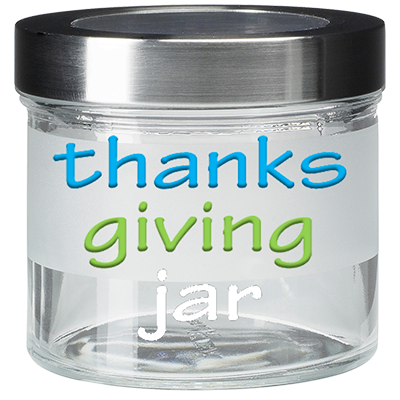 You can create your gratitude jar and fill it all year, the month leading up to Thanksgiving, or just on the day of your feast when family and friends arrive. Throughout your turkey dinner, everyone can take turns reading the gratitude entries out loud. This is a great conversation starter and perfectly captures the spirit of the holiday. Not to mention, scientific research has found that the practice of focusing on gratitude a few minutes each day tends to positively influence attitudes, increase happiness and joy, foster relationships, encourage compassion, and improve overall well-being including immunity. So, grab your mason jars (or bowls or boxes), recycled paper, and pens and celebrate life’s blessings! For more holiday DIYs, visit Honest on Pinterest! Thanks, Felien! We’re glad you’re inspired. We love this one because it’s perfect all year round. Yes it totally is! It would be even great as a birthday present! Great idea! How fun for everyone at a party to share a loving sentiment with the birthday person. Order yours and be part of the many that are leading a thanks giving life. attitudes, increase happiness and joy, foster relationships, encourage compassion, and improve overall well-being including immunity. parents, spouses, siblings, friends, children, chocolate, jobs, health, happiness, hobbies, toy cars, movies, pets, pie, sports, sunshine….